Before coming to us Spotty and Lilly were kept in a concrete shelter, and we doubt they had an outside enclosure. So finally arrived at our place they really enjoy being outside now with all bushes, agaves, hollow treestumps and pipes to hide in. During daytime one can hardly see any action with the black-footed cats, they are really nocturnal cats. It is fun to observe them in the dark hours, as they are far more active and relaxed then. 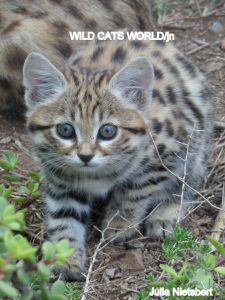 At nighttime wild black-footed cats can hunt up to 10-15 small prey a night. After arrival a week of big worries started for our caretakers team, as both cats didn’t seem to eat. We were told they loved pigeons, but also pigeons they weren’t very keen on the first few days. All the way from Holland, owner/CEO Babette de Jonge, tried to think of ways to make them eat, and the team in the end succeeded to make them eat mice and rats. Game meat, fluffies (one day chicks) and chicken, what most black-footed cats in our project loved, they didn’t want. We were very afraid the days of not eating would do them harm, but so far they seem to be doing well as far one can judge with this secretive species very vulnerable to stress and illnesses. Females Lilly and Diva have to share Spotty now, but he seems to like them both. 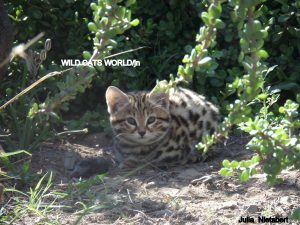 We very much hope both females will soon give birth to some kittens and that they will be raised successfully, as this is very important for the Black-footed Cats Conservation Project. Endanged in the wild and at the same time very rare in captivity, we will do everything that’s in our power to contribute to the survival of the species, and Spotty, as the one male, will be an essential ambassador in our present and future endeavours. 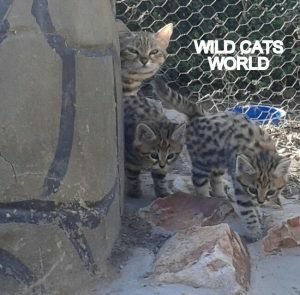 Our black-footed cat ambassadors, females Diva & Lilly and male Spotty, are doing fine. It is great to see them so active and enjoying each other’s company. Of course our hope and aim is for our females to be able to raise some successful litters of kittens, but it is up to Spotty to help us with that. 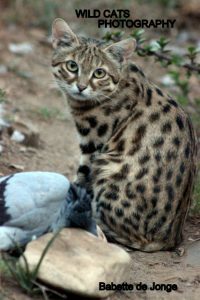 Note: The black-footed cat, also called small-spotted cat (Felis nigripes), is the smallest African cat and endemic to the southwestern arid zone of the southern African subregion. It is listed as Vulnerable on the IUCN Red List since 2002, as the population is suspected to decline due to bushmeat poaching, persecution, traffic accidents and predation by domestic animals. 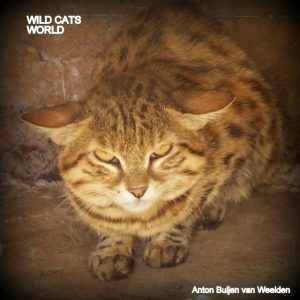 At Wild Cats World the black-footed cats conservation project is a very essential one. In every possible way we hope and try to contribute to this incredible but sadly very endangered species! 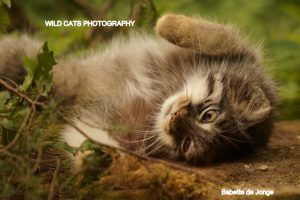 The kittens are very welcome as they are very essential for their species, as well as for our conservation program. We haven’t officially sexed the kittens yet, but have reason to believe they are two males. We will let you know once sexed and named of course. Herewith already some nice pictures by caretaker Inge and from our volunteer Jule Nietsbert from Germany. 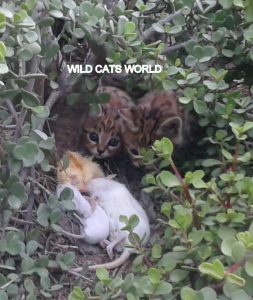 Lilly and her kittens are also starring in a Japanese documentary, which will be presented next year to educate children and their parents about South African native species. 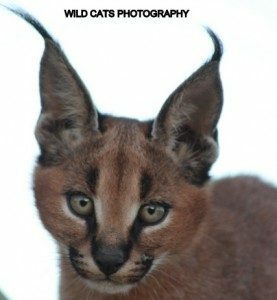 Also our serval Joy, caracals Nina/Leo and Thilido, as well as our leopard Bella will be starring in the same documentary.